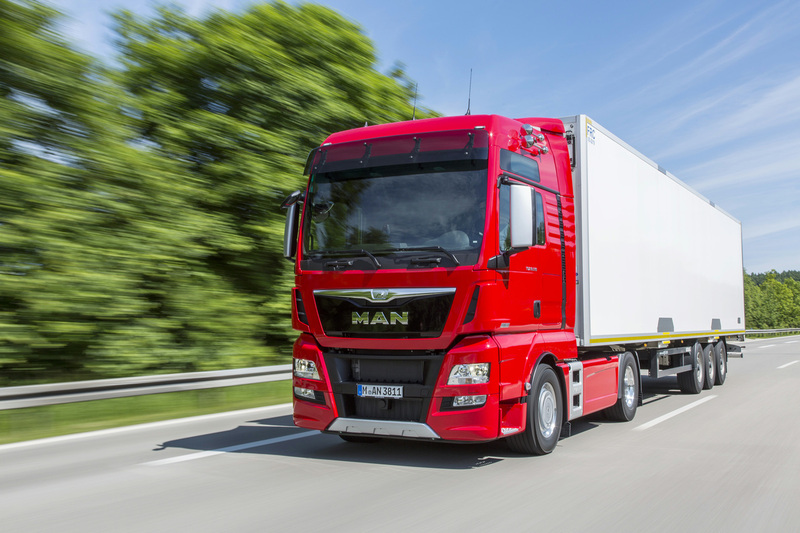 As the second largest exhibitor at the IAA, MAN Truck and Bus presents new vehicle and engine technologies, with the top-of-the-range TGX D38 truck with up to 640 HP as its centrepiece. Efficiency meets Performance: The MAN TGX D38 with 520 hp unites superior power with low total costs of ownership (TCO). The new GPS-controlled EfficientCruise saves up to six percent fuel. We are delighted to invite you to our press conference on 24 September 2014 at 8:30 AM to be held at our exhibition stand B 14 in Hall 12. There we shall present all of the innovations and highlights from across our product range. Throughout the press day, our experts and press contacts will be on hand to answer your questions. With its new 15.2 litre six-cylinder engine which boasts 520, 560, or 640 HP, the flagship TGX D38, is proudly displayed as a world first at the IAA 2014. A leading light on the innovation stage is the 640 HP heavy-duty prime mover. The 19 trucks on the stand and in the outdoor areas represent the product and sector variety achieved by the TGL, TGM, TGS and TGX series. Consumption efficiency – this central theme goes hand in hand with our goal of reducing CO2 emissions. The new TGX EfficientLine has all of the efficiency technologies on board, most notably the EfficientCruise GPS Tempomat and the TopTorque torque enhancer for fuel economy. In the TGX EfficientLine, designed with consistent fuel economy in mind, MAN has the most successful model on the market. Since its market launch in 2010, more than 27,000 customers have chosen the EfficientLine models and packages. MAN has reworked the complete D26 engine portfolio for trucks of 400 to 480 HP and provides the TopTorque function throughout that gives an extra 200 Nm torque in the two highest gears. This puts the new engines on a parallel with long-design drive trains, thus achieving sustainable fuel economy. MAN is also giving viewers a glimpse into the future of natural-gas trucks with a MAN TGM with a 280 HP CNG engine. MAN is integrating the progressive Efficient Cruise GPS Tempomat into TGX and TGS series, and into buses, thereby making a significant contribution to the reduction of CO2 emissions in commercial vehicles. In the buses sector, MAN is exhibiting a Lion's Coach as well as three MAN Lion's City coaches with CNG, hybrid and Euro 6 diesel drives. The NEOPLAN coach brand is represented by the Skyliner, Cityliner and Jetliner models. MAN Latin America will also attend the trade fair, exhibiting two VW Constellations and a VW Volksbus for international markets. MAN Solutions focuses on the interweaving of services that provide the customer with valuable opportunities to reduce costs, and MAN will present a whole host of innovations in this field at the IAA.